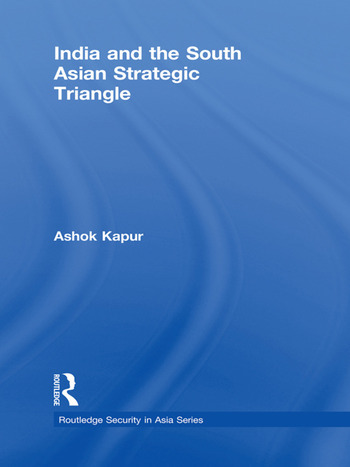 This book traces the triangular strategic relationship of India, Pakistan and China over the second half of the twentieth century, and shows how two enmities – Sino-Indian and Indo-Pakistani – and one friendship – Sino-Pakistani – defined the distribution of power and the patterns of relationships in a major centre of gravity of international conflict and international change. The three powers are tied to each other and their actions reflect their view of strategic and cultural problems and geopolitics in a volatile area. The book considers internal debates within the three countries; zones of conflict, including northeast and northwest south Asia, the Himalayas and the Indian Ocean; and the impact of developments in nuclear weapons and missile technology. It examines the destructive consequences of China’s harsh methods in Tibet, of China’s encouragement of military rather than democratic regimes in Pakistan, and of China’s delay in dealing with the border disputes with India. Ashok Kapur shows how the Nehru-Chou rhetoric about "peaceful co-existence" affected the relationship, and how the dynamics of the relationship have changed significantly in recent years as a range of new factors - including India’s increasing closeness to the United States - have moved the relationship into a new phase. Ashok Kapur is Distinguished Professor Emeritus in Political Science, University of Waterloo, Canada. He is author of several major works including India - From Regional to World Power (also published by Routledge), and is co-author of Government & Politics in South Asia, 6th edition.